Nearly-beached manatees and almost-trashed sea turtles: Two close calls for coastal wildlife made headlines last month. 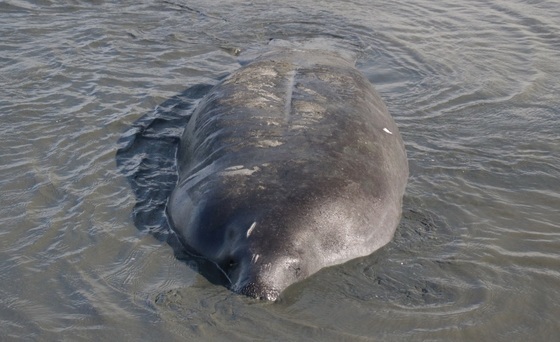 On July 18, the falling tide trapped six manatees – likely males chasing a female – in a large runnel, or tidal pool, on Jekyll Island. No problem: The big mammals settled into the shallow water and mud and some even napped until next high tide set them free, said Trip Kolkmeyer of DNR's Wildlife Conservation Section. 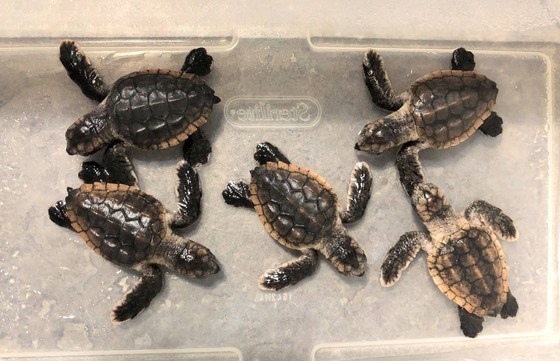 Almost a week later, a housekeeper at Admiral’s Inn on Tybee Island found six live loggerhead hatchlings in a trash can in one of the hotel's rooms. Thanks to her prompt action, five of the federally threatened turtles were returned to the surf by the Tybee Island Marine Science Center (video). The sixth will be kept at the center for outreach until it turns 2. Georgia sea turtle nesting and hatching updates. One person wondered on the DNR Wildlife Resources Division Facebook page why the sea turtle hatchlings were released during the day. They noted that most nests hatch late at night when birds are less likely to eat the young. Follow Wildlife Resources on Facebook, Twitter and Instagram. When Georgia bat counts ticked up 1 percent this winter compared to last, it didn’t ease worries over white-nose syndrome. Totals in the caves DNR surveys are still down 93 percent from historical highs. (Think one bat today for every 10 counted before.) The disease that has killed millions of bats is hammering north Georgia’s most common species: the tri-colored. And except for gray bats, Myotis bats are simply no longer seen in the region. DNR senior wildlife biologist Katrina Morris said she “wants to be excited about” the increase, but the reality is sobering. “We had a real winter, and I think it’s more likely there were more bats in the caves,” because of the more persistent cold, said Morris, who leads bat surveys for the Wildlife Conservation Section. This just-released report and story map detail findings from the 2017-2018 surveys. Learn more about white-nose (WNS) in Georgia at www. georgiawildlife.com/wns. The good: Neither WNS nor Pseudogymnoascus destructans (Pd), the introduced fungus that causes the disease, have been confirmed in Georgia south of Polk County. A survey of bridges and culverts, which often double as bat roosts in the cave-scarce Piedmont and Coastal Plains, is probing whether these transportation structures are transmission corridors for Pd. Results from samples taken at the sites are expected later this year. 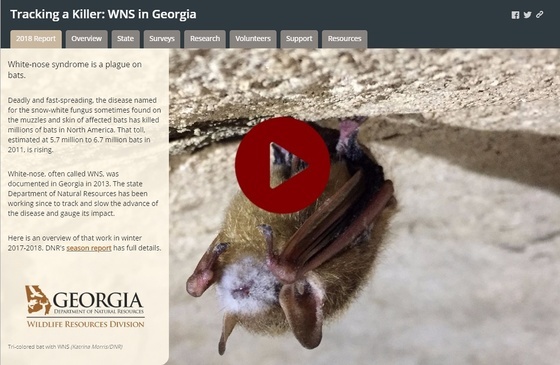 The bad: North Georgia is saturated with WNS and bat counts have dropped "across the board," Morris said. The outlook is grim. In the northeastern U.S., where the disease was first documented on this continent, only a few hard-hit sites have since seen bat populations increase. Numbers at most remain low. One thing I have learned is that most of my wildlife neighbors are opportunists. And with four o'clocks in full bloom, a handful of nectar feeders are taking full advantage of these colorful garden favorites. 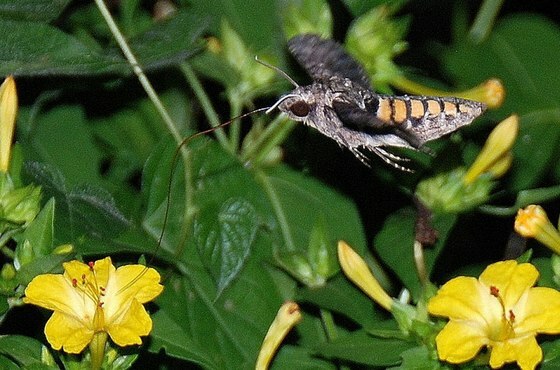 Four o’clocks have graced Georgia backyards for generations. These hardy, bushy perennials can reach 4 feet tall, they’re easy to grow and from midsummer into fall they produce bouquets of fragrant blossoms. Read Terry’s column to discover who's feeding at the four o’clocks. A day at the office brought Stephanie L. Cherry-Farmer face-to-face with one of nature’s more unique takedowns: a praying mantis vs. a bird. The encounter happened last month at a hummingbird feeder outside DNR Historic Preservation Division headquarters at Panola Mountain State Park. Cherry-Farmer is the division’s National Register and Survey Program manager. The predator appeared to be a Carolina mantis, common in the Southeast and South Carolina’s state insect. The prey was a ruby-throated hummingbird, likely a juvenile. A female Carolina mantis can reach about 2.4 inches long (the one pictured may appear larger in part because the different orientation of the bird to the camera). Ruby-throats are 3.5-3.7 inches, with juveniles slightly smaller because their bills are initially shorter than an adult’s, according to Dr. Bob Sargent, a program manager with DNR's Wildlife Conservation Section. 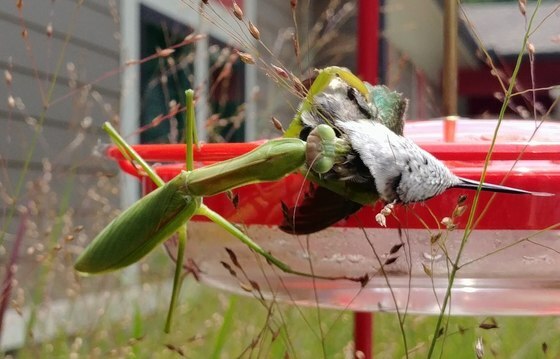 While a mantid tackling a hummer is a rare sight, it is a sight seen around the world. A study in The Wilson Journal of Ornithology cited 147 instances in 13 countries of mantids capturing small birds. More than 70 percent were in the U.S., and ruby-throated hummingbirds were the most common prey. Of the incidents worldwide, nearly 80 percent of the birds attacked were killed, according to the study. Add another fatality to the list, this one at Panola Mountain State Park. 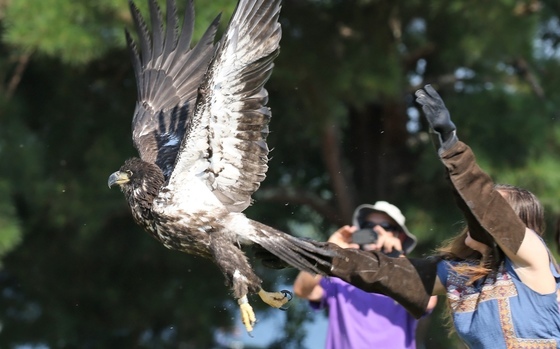 An immature bald eagle rehabilitated by Auburn University’s Southeastern Raptor Center was banded by DNR and released at West Point Lake July 28 (watch). The eagle, about 18 weeks old, was taken to the center after reportedly falling from a nest in Thomas County. That wasn't the bird's last brush with disaster: Shortly after the release, an adult bald eagle dove on but didn’t hurt the young eagle. Recovering America’s Wildlife Act is in the U.S. Senate. The bipartisan bill would provide crucial support for states to conserve the nation’s full array of wildlife, using existing revenue from energy development on federal lands. The Senate measure matches the House’s except the $1.3 billion is not dedicated but subject to appropriation by Congress, a key difference supporters plan to work out. The “Botany Bill” is in both chambers, as well. This conservation legislation encourages federal land management agencies to hire botanists, research native plant materials and integrate native plants in projects when feasible. Take a deep dive into the Georgia Outdoor Stewardship Amendment at www.georgiaoutdoorstewardship.org. In the Nov. 6 general election, voters will decide the state constitution change that would dedicate a share of the existing sales tax on outdoor sporting goods to protect Georgia's lands and waters. The DNR booth at Fernbank Museum of Natural History’s Reptile Day drew a crowd of young and old. 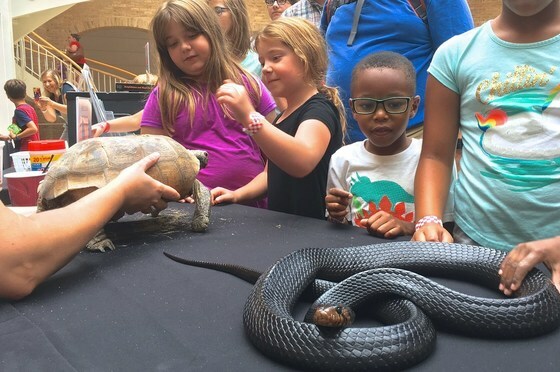 Visitors – about 2,500 attended – learned from Environmental Outreach Coordinator Linda May and senior wildlife biologist John Jensen about Georgia’s native reptiles and enjoyed first-hand experiences with a gopher tortoise, an alligator, an eastern indigo and other snakes. Learn about everything from prescribed fire to restoring quail habitat and attracting backyard birds at the Agroforestry and Wildlife Field Day Sept. 20 in Griffin. This unique educational event held every three years features experts in the field providing advice and demonstrating techniques. Waterfowl, other wildlife and wildlife watchers will benefit from $8.7 million in wetlands projects at Altamaha Wildlife Management Area near Darien. Expanding a long-standing partnership, Ducks Unlimited will work with DNR to restore and enhance wetlands at the WMA, an effort powered by federal grants secured by Ducks Unlimited and funding from the Coastal Conservation Association, DNR and Federal Emergency Management Agency. Meet the beetles, and the forestry rock stars helping save north Georgia’s hemlocks from them, during the first in a U.S. Forest Service Foothills Science Series set for Aug. 9 in Dahlonega. Register. Georgia’s 2018-2019 guide to hunting seasons and regulations is available online and in print. Pick up a copy at license vendors statewide or view and download one at www.georgiawildlife.com. Names in the news: North America’s top game warden is DNR Cpl. Brian Adams. The North American Wildlife Enforcement Officers Association presented the Glascock County warden its 2018 Officer of the Year award. Jenifer Wisniewski, DNR Wildlife Resources Division’s marketing and communications manager, received the Spirit of ACI award at the Association for Conservation Information's annual conference. The award honors members who show extraordinary commitment and effort on behalf of the national organization of natural resources communicators. Wisniewski also is the association’s new president. One more note from that conference: Georgia Wild placed second in the External Newsletter competition category, as did the Wildlife Resources Division website www.georgiawildlife.com in the Website category. Rob Williams of the Institute of Georgia Environmental Leadership and Georgia State University is the Georgia Conservancy's 2018 Distinguished Conservationist. Williams will be honored at the nonprofit's annual ecoBenefête, Sept. 21 in Atlanta. 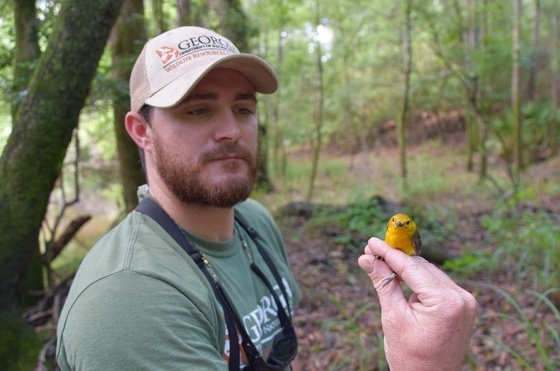 DNR’s Zach Henshaw, above, holds a prothonotary warbler banded in south Georgia, part of a study exploring the bird’s use of nesting habitat in riparian corridors in the region. 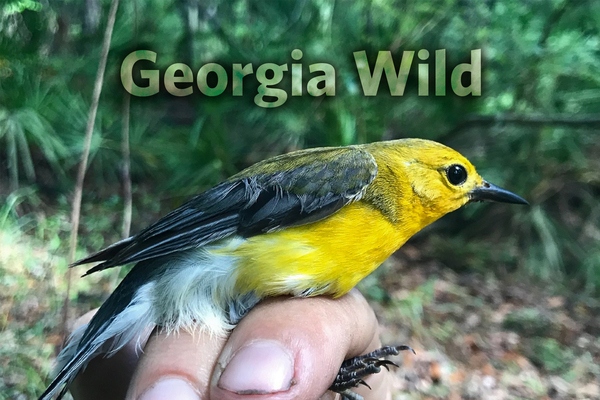 Striking in looks, this species is shrinking in numbers and considered a Georgia State Wildlife Action Plan priority. Prothonotaries are found in flooded swamps and hardwood bottomlands along rivers and streams. They nest in cavities -- the only southeastern warbler to do so -- and often over water. Wildlife Conservation Section biologist Joe Burnam and Henshaw have placed 45 nest boxes along the Ochlockonee and Alapaha rivers on Alapaha River and River Creek, the Rolf and Alexandra Kauka WMAs. The warblers’ use of them is being recorded. Point-count surveys done along rivers throughout breeding season are helping size up the abundance of prothonotaries at the sites. So far, six nests in boxes have been documented, and 21 adults and young banded. Next up: Examining abundance at sites with and without boxes and by habitat type and riparian corridor width. Site fidelity from year to year will be checked by monitoring birds fitted with leg bands. About that name: The origin of the prothonotary’s name is often linked to church or court officials who wore golden hoods or robes. But, historically, that connection may be questionable, according to this writer. It only takes a seed – or in this case, 55 million of them – to get a grassland going. The yellow Indian grass above is germinating near the Chattahoochee River at Sweetwater Creek State Park. DNR's Wildlife Conservation Section and State Parks & Historic Sites Division and the Georgia Forestry Commission are restoring almost 100 acres of grassland at the Lithia Springs park. 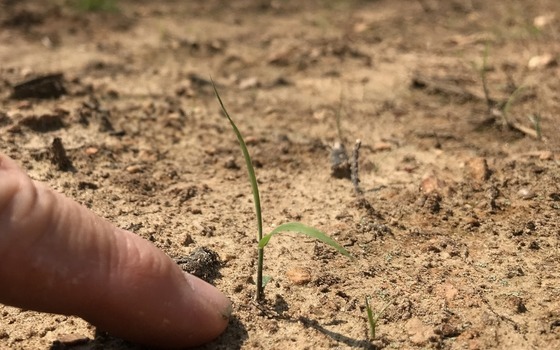 According to Wildlife Conservation’s Tripp Colter, the area has been cleared of invasive Bradford pear and more than 300 pounds of native grass seed planted. Those estimated 55.7 million seeds were harvested from a similar project at Panola Mountain State Park. The work at Sweetwater Creek will help pollinators – native wildflowers will be added – and grassland birds, a group of North American birds in steep decline. As a sign of things to come, one grassland species, an eastern kingbird, was recently seen at the site.